On November 8th, I experienced an ideological death that I could only describe as grieving. It resulted in 3 months of a heightened sense of confusion, hopelessness and a disconnect to the world around me. I am a woman, a minority and an immigrant in America. I’ve experienced both the contrast and extremities of growing up as a privileged person in a third world country, to moving to a predominantly white, suburban neighborhood in America isolated as a minority. Later I experienced the diversity of going to public school in a city where every student had a cultural identity outside of America. I grew up in an egalitarian household where both my parents worked, and though they came from opposite sides of the world, they shared vision of a better life in a country that provided opportunity for all. Moving to America renewed a sense of purpose and drove them to create a meaningful life in a foreign place. If there’s one thing I learned from this election, is that the power of our experiences shapes our perspective. Over the past 5 years, I’ve traveled frequently across America and I’ve traveled around the world. I’m grateful to have the opportunity to pursue my passion for a living, and as I reflect back, the creative risks I’ve taken stems from growing up with the option to choose. What I’ve learned from what I see now as an unconventional childhood having moved to multiple neighborhoods, to now a career that allows me to travel, is that experience offers you a wide lens and breadth of diversity that allows you to see the world more openly. Despite all our differences, people just want the freedom to make the best decisions to improve the quality of their life, and in return, allow it to positively affect their community. America was built on a history and repertoire of inclusiveness, diversity, and opportunities for all walks of life, and I march to support ideas that draw on our freedom of choices. 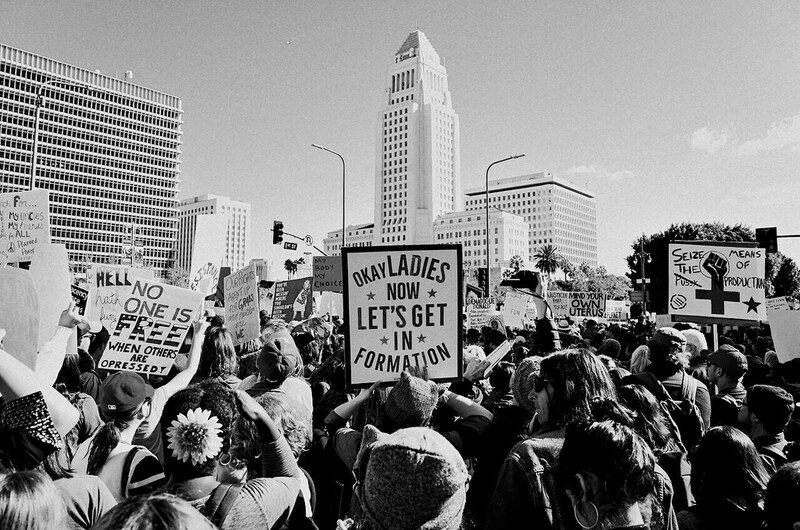 The Women’s March in Los Angeles was a celebration of this. In a time of divisive rhetoric and isolating ideals, watching women, men, and children of all ages, races, classes and orientation spilling out on the streets from cities around the world from Washington D.C. to Los Angeles was a moving experience I’ll never forget. Millions of people took to the streets to express their urgency to protect one another – the experience completely mended my faith in humanity. I march because I strongly support the rights and resources given to every individual in the areas of that affect me, and I march to support the laws that allow, rather than inhibit those beyond my scope of experiences. There are few things that’s comforted me through this, and one I keep returning to is a quote from MLK: “Darkness cannot drive out darkness, only light can do that. Hate cannot drive out hate, only love can do that.” While I will try to keep an open mind, I urge those of you with conflicting ideologies to do the same. When we strip away all of our differences, one constant remains the same. We’re only human, and we innately desire a life that allow us freedom to choose. Freedom to marry who we want, regardless of our orientation, freedom to walk outside without fear or intimidation of our ethnic or racial identity, and freedom for women to make one of the most personal and difficult decisions in their life. I march so that I have a voice in the America that I have grown up to know: inclusive, diverse, imperfect but welcoming.